What this is telling us is that for the 22% reduction in calories experienced by the Low-Calorie mice, there was only a 12% drop in fat mass, relative to the controls, while for the lucky mice on Phentermine, there was a mere 6.6% decrease in intake, yet a whopping 15.9% decline in bodyfat, 2.4 times the change in intake. 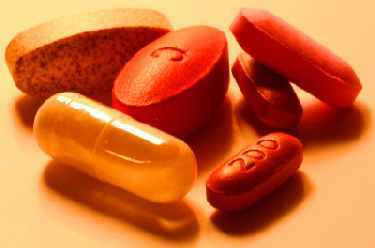 Looking at the numbers this way, Phentermine and Mazindol are again the clear winners. “Get Your Back into It!” So where do these differences in results come from? At the risk of charting you to death, let’s look at another interesting and critical statistic from this study: energy expenditure. I keep saying that it is innate EE and not intake that ultimately determines our bodily fat content; well, here is more proof of that concept. If you compare the body fat mass graph (above) with this EE graph, you will see that these bars do track–the drugs which induced the greatest energy expenditure (as measured during the six hours post-medication at four time points) resulted in the least fat mass. 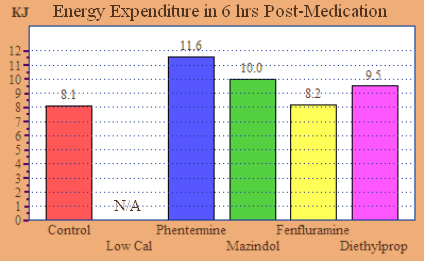 Among these four drugs, again, Phentermine is the obvious star, raising EE by 43% over control. Before I leave this informative study, I would like to point out one more set of measurements the researchers made—body water and lean mass. At this point, it shouldn’t surprise you to learn that only Phentermine and Mazindol increased both body water and lean mass by a statistically significant amount compared to control. Good luck getting that result with any old low-calorie diet regimen! If the underlying cause of obesity is actually low energy expenditure and not high calorie intake, then isn’t the obvious solution something that increases EE rather than decreases intake? From the results of this study, it should seem clear that a good diet medication will be a poor appetite suppressant and a powerful energy enhancer. “Time in a bottle” Now there are two points I want to make here. The first is that this study only looked at two time points—baseline and eight weeks. It would have been really nifty if the measurements had been taken weekly to show how the variables changed over time, and it would have been super cool to see what happened during the next eight weeks, but alas, research costs money, and there was no blockbuster drug at the end of this rainbow, so they did what they could. 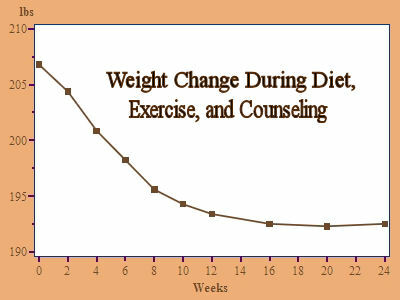 In all likelihood, the change in energy expenditure was a gradual adaptation over the study period, with most of the weight gain coming early and slowly decreasing, as seen in other studies, and if I make my guess, the energy expenditure rate would have continued to increase in the following weeks to the point that all the excess calories were being burned and no more weight was being gained. My other point is with regard to the NEAT. As the researchers pointed out, despite the inter-subject variability in changes to energy expenditure, the change in NEAT correlated very tightly and negatively with the change in fat gain (R=-.7). That is, subjects whose NEAT increased the most gained the least. Contrast this with what we saw in the Thomas and Miller rat study in Calculus, where forced exercise was met with a concomitant decrease in NEAT. From these data, it can be surmised that NEAT is a primary defense mechanism against exogenous alterations in energy balance. Changes you make to diet and exercise will be countered with adjustments to NEAT—your body’s subconscious drive to fidget, wiggle, whistle, talk, laugh, dance, hug, kiss, and yes, even change the channel. What we’ve shown here is that the difference in people’s weights has precious little to do with how many cheeseburgers we eat or how many marathons we run, but rather much to do with energy expenditure variables we cannot voluntarily control—TEF and NEAT. All we have proven so far is that when our bodies sense a surfeit or deficit in energy supply, they attempt to balance it with changes to both energy storage and energy use, the relative percentages of which are highly variable between individuals. But what makes some folks more prone to the storage side and others more prone to “use”? We’ll explore that question in my next post, Through Thick and Thin. In The Biggest Medical Myth of All Time, we reviewed some of the evidence that losing excess body fat is not as simple as the supposedly tried-and-true formula of eating less and exercising more. And that’s because our bodies are not simple machines, like cars or televisions or the iPhone 3GS. 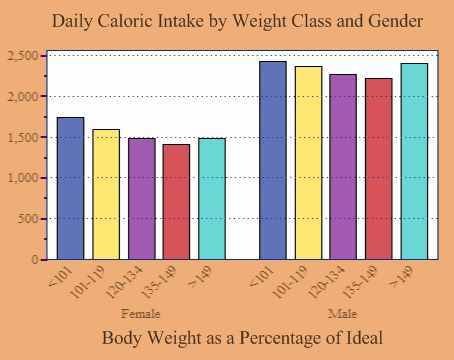 In this post, we’re going to examine the calorie balance theory: Calories In – Calories Out = Fat Lost/Gained, and build an understanding of why we can’t fool our fat-o-stats with a step-aerobics video and a freezerful of Lean Cuisines. REE=Resting Energy Expenditure, the rate of oxygen consumption when fasting and completely at rest. TEF=Thermic Effect of Food, the increment in oxygen consumption seen just before, during, and after a meal. EEE=Exercise Energy Expenditure, the increment in oxygen consumption attributable to volitious exercise, such as jogging, playing hockey, etc. NEAT=Non-Exercise Activity Thermogenesis, all non-volitious activity over and above lying completely still. Now, I should say that even this equation is a vast oversimplication, since the relationships among these variables are not independent. EEE and NEAT both depend on REE and can be effected by TEF, and interact with each other, as well. TEF is most often thought of as a function of REE, but also varies with the volume and types of foods eaten, as well as proximity to exercise. That said, however, the equation makes a decent model for a given individual at a given point in time, so let us consider each of these in turn. Much research has compared the REE between lean and obese persons, and, while slight differences are sometimes reported, for the most part, REE can be attributed to the maintenance of lean body mass—muscle, bone, skin, hair, etc. Even highly trained athletes don’t show a significantly higher REE than couch potatoes of the same size and body composition.2 When people alter their intake acutely for a short period of time, or modestly for a long period of time, however, the REE, when measured per unit of lean body mass, will show a commensurate adjustment, albeit a small one. Let me make that clear: if a person has dieted (or gorged) for a suitable length of time, he will burn a different number of calories at complete rest than will a person of exactly the same size and body composition who hasn’t altered his diet. Some studies will fail to show this, but likely only due to methodological differences (sample size, study length, measurement technique). 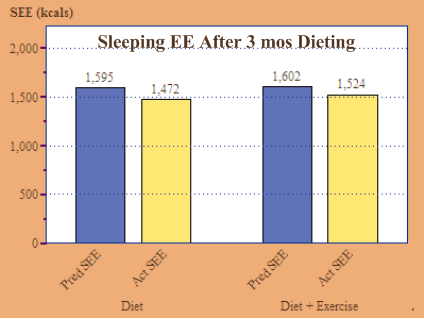 As an example, in 2006, researchers showed that the metabolic rate of mildly overweight people during non-movement sleep (a decent proxy for REE) decreased after just three months of a 25% calorie deficit, created through diet alone or diet + exercise. In the graph, you see sleep energy expenditure (SEE) predicted from baseline SEE and three-month LBM, compared to the actual three-month SEE. The difference is small, but significant: 7.7% for the diet-only group, and 4.9% for the diet+exercise group. The difference persisted over the next three months, when the subjects were fed the amount necessary to maintain the three-month loss. Now here’s where things get interesting. As far back as the 19th century, scientists were fascinated by what was then called Specific Dynamic Action, the significant increase in metabolic rate that occurs when we eat and for several hours after. Early researchers observed that TEF varied with the size and composition of the meal and so logically drew the conclusion that TEF represented the energy cost of digestion and assimilation of the meal, which is how it is still often defined today. This isn’t entirely accurate, however. Researchers began to notice that there were significant variances in TEF between individuals, even when eating the same exact meal under the same circumstances. That fact suggested that TEF was not solely the processing cost of food. In fact, many studies found that TEF was consistently higher in lean vs. overweight folks, which led to explorations of what else might be involved in TEF. 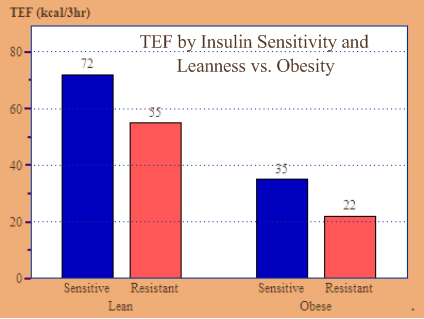 In a series of elegantly designed experiments, Dr. Karen Segal and her team showed that insulin resistance and body fatness are independently and negatively associated with TEF. In this image, we can see that insulin-sensitive, lean persons burn considerably more calories in response to a given meal than do insulin-resistant or obese persons, matched for LBM and RMR. Clearly, there is much we have to learn from studying TEF, even if it is a relatively small portion of our daily TEE, and I’ll get into that more deeply in another post. The calories burned as a result of activity over and above REE can be divided into Exercise Energy Expenditure (jogging, tennis, pilates, etc.) and Non-Exercise Activity Thermogenesis (showering, fidgeting, channel-changing). The former is pretty straight-forward; it’s basic physics: work = mass X distance and force=mass X acceleration. The distance you move something—like your arm or a barbell—through space, and the force you use to do so can be combined to calculate the calories burned in the process. Okay, there’s a bit more to it than that, as there are effects from exercise training and efficiency, and interactions with the fuel source (sugar or fat), but for the most part, moving a given weight a given distance at a given intensity has a set value, regardless of our body’s fat content. The same could be said of NEAT, except for one important difference. For most of us, EEE is the result of a willful, conscious act; whether we enjoy the activity or not, we make the decision to spend 30 minutes or an hour or the whole afternoon playing golf, painting the den, or using the elliptical trainer. NEAT is much more about unconscious movements—the number of times we get up and walk to the window to look outside, how often we feel the urge to head to the water cooler for a gossip-fest, whether or not we are drumming out our favorite song on our desk while reading email—in short, how inclined we are to fidget, pace, or otherwise “waste” energy. So why do we make this distinction? Because our inclination toward non-exercise activity is a key element in balancing the energy expenditure equation. Let’s look at some science behind that statement. A group of researchers at Mayo Clinic was given a great deal of credit for their research into the NEAT concept about a decade ago, but in reality, the idea of compensatory changes in NEAT goes way back to the mid-twentieth century. In a delightful study performed just down the road at UNC-Chapel Hill, a group of Sprague-Dawley rats (a strain of rat disinclined to high levels of activity) showed researchers what happens to NEAT when sudden changes are made in EEE. The scientists forced the rats to run on little rat treadmills for a specified distance and at a specified speed for the first three days of each week, then allowed them to rest the other four. 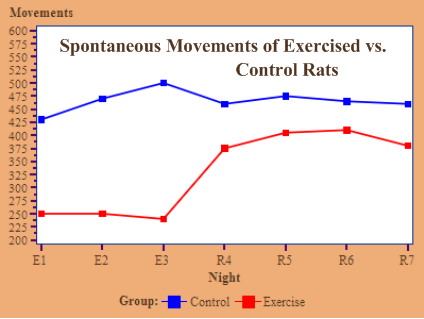 This experiment went on for five weeks, and during the final week, spontaneous activity of the animals was measured during their non-exercise period and compared to matched controls. What the researchers discovered was quite fascinating. Spontaneous activity was greatly reduced on the three exercise days and modestly reduced on the four non-exercise days. That is, the forced increase in EEE was compensated for by an unconscious decrease in NEAT. Furthermore, following cessation of the experiment, there was a “persistent depression of spontaneous activity” for “a very considerable period of time”. The rats’ little bodies were battling back against the attempt to use a lot more energy than they were naturally designed for. “The dieter’s playground” So what is all this telling us? Well, the next time someone refers to weight loss dieting as a roller coaster, you can correct them—it’s not a roller coaster, or a merry-go-round, and it’s certainly not “The Fun House”. It’s more like a see-saw—the harder you push down on your end, the higher up you’re going to bounce when your body pushes back. In my next post, The Real Bathroom Scales, I’ll review a detailed example of how the elements of the energy expenditure equation respond to overeating in different body types. Without a doubt, the greatest medical myth of all time is that obesity, or any degree of excessive body fatness, is the direct result of excessive food intake and/or insufficient exercise. Ask anybody. Literally. Ask 100 people, including scientists and health care practitioners, and 99 will tell you this. Ask 100,000, and 99,999 will give the same answer. The other one doesn’t speak English. Yet despite this widespread belief, there is no good research to back this up, and plenty of scientific evidence to the contrary. “Eat Less and Exercise More” I’ve heard it said that obesity must be the result of a caloric imbalance, because the First Law of Thermodynamics cannot be controverted, and indeed, this is the case. 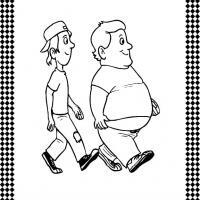 What people are failing to understand is that we cannot control our caloric balance via diet and exercise. Although we can adjust the amount of food we put into our mouths and how much physical activity we perform every day, our bodies determine what percentage of the available energy to use in the production of heat and physical energy and how much to store as fat. This is the real reason that overweight people often feel tired, sickly, and run-down—their bodies apportion input calories more in the direction of fat storage than energy production, and reducing calorie intake or increasing physical exercise only makes the situation worse. Let’s look at some numbers…or better yet, a few graphs (statisticians love graphs). 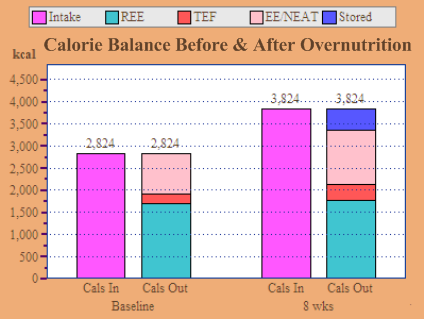 Typical research studies on diet and exercise last three months. It’s considered a sufficient amount of time to measure significant changes in body parameters. Funny thing about three months, though—it happens to be just about the amount of time the average person’s body needs to completely adjust to a caloric imbalance. Here’s a graph showing what happened when a group of overweight people were treated with a medically-supervised, low-calorie diet, moderate exercise, and “behavior modification” program for longer than three months. I’ve looked at a lot of similar graphs over the years; the pattern is predictable—initial rapid weight loss, then slowing, then stopping. And all of this happens while still sticking to the original regimen. Of course, the diet “counselors”, friends, and family doubt that the patient is still sticking, but they shouldn’t. As numerous studies have shown, this is what will happen to 95% of overly fat people when a caloric deficit is created through diet and exercise. (We’ll cover the reasons why in another post.) So is life just not fair? 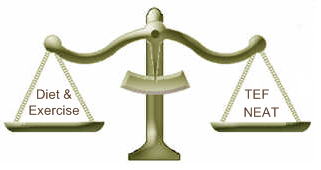 Well, no, it is fair, because happily, the opposite relationship between caloric balance and weight also exists. That is, intentionally increasing caloric intake above current maintenance levels results first in rapid weight gain, then slower weight gain, and finally, weight maintenance at the new higher levels of both weight and calories. “Just push yourself toward the table!” Studies have shown that it is just as hard for an otherwise weight-stable person to gain beyond a certain level (~10% of current weight) and to “keep it on”, as the reverse. 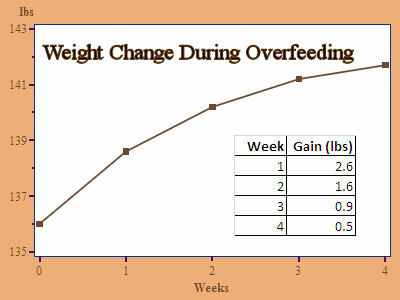 Notice the trend in this graph from an early study on the subject; weight is increasing, but less so with each passing week, and if one were to extrapolate (this study ended at 4 wks), it’s clear that the weight increase was approaching a level maximum. In what was probably the seminal study on the issue, E.A. Sims, an obesity researcher in Vermont, enlisted a group of naturally lean prison inmates to willingly overeat their way into obesity in order to study the effects of the disease as separate from the genetic factors that cause it. Well, much to his dismay, he found that, despite their best efforts—which included eating 6-7,000 calories a day and refraining from all work and exercise—the prisoners struggled to add and then retain the requisite 25% to their weights, even though they were eating 200% of their previous intake. One particularly lean fellow could never gain more than twelve pounds (9% of his initial weight) after months of stuffing his face and lounging around in his striped pajamas. In an alternate universe where “Weight Watchers” is a support group for overly thin people trying to bulk up, this poor guy would have been labelled lazy, undisciplined, and probably stupid, as well, for not doing what was needed to meet his weight goal. “Energy is neither created nor destroyed…” So now we might be agreed that diets do not continue to cause weight loss, but many would argue that they can still be used to cause some weight loss, which could then be maintained by eating a “normal intake” (which assumes the overweight eat more than the thin to begin with—an errorneous assumption to be dealt with another day). Well, as it turns out, even a brief period of reduced calorie intake will cause the body to adjust its current level of “energetic efficiency”—the rate at which calories are partitioned toward energy versus fat storage. Let’s see what happened when a group of rats decided to lose a few for bikini season. In a cleverly designed experiment by long-time obesity researchers Dulloo and Girardier, half of a group of young rats were put on a diet, while the others were allowed to eat whatever they wanted (the “ad libitum” group). 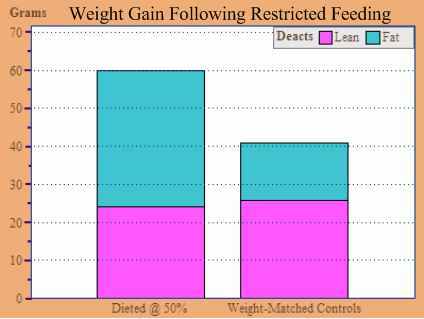 The dieters were fed exactly 50% of what the ad lib group ate spontaneously, for a period of 30 days. At the end of that time, the dieting group was then matched to a third group of rats by both weight and body composition (that is, their total weight and percentage body fat were similar). For the next 25 days, the previously food-restricted rats were fed exactly what these similar-sized, non-dieted rats chose to eat naturally. 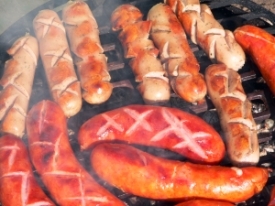 If there was no adaptive mechanism, the two groups of animals would be expected to dispose of the calories in a similar fashion, but in fact, that was not at all what happened. 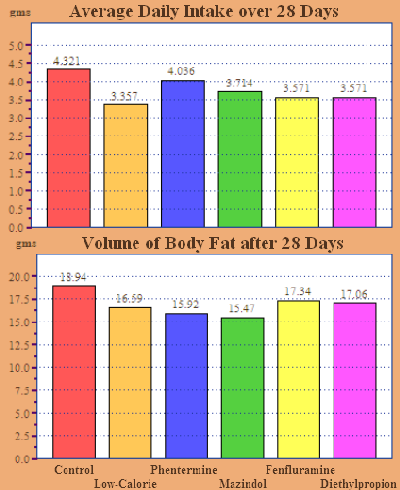 Since they were young rats, they all gained weight during the 25 days of pair-feeding, but the gain and relative proportions of fat and lean tissue were vastly different, as the chart illustrates. The dieted rats gained the same amount of lean tissue, but more than twice the fat of their free-eating counterparts, on the same number of calories. This experiment clearly shows that the bodies of the dieted rats made not just minor, but rather gross adjustments to their calorie-burning efficiency and to the preferential deposition of lean and fat tissue. Thus, when dieters return to eating “normally”, where normal is the amount eaten by a person of similar size and body composition, they will lay down fat like nobody’s business. So what makes this seemingly implausible variance possible? That will be the subject of my next post, “The Calculus of Calorie Counting”.